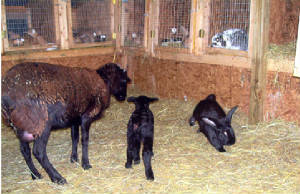 The original Flemish was an unappealing rabbit of steel gray color with black and tan barring on the legs. Their large ears drooped over at the tips and they did not resemble our graceful rabbit of today. Our Flemish Giants have been refined and bred to carry their large weight on a strudy bone structure, giving an appearance of massiveness. Yet their size belies their gentle nature. 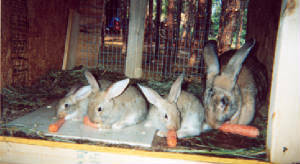 Flemish Giants have been known for over 400 years. 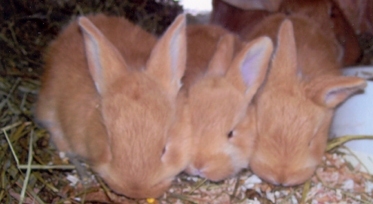 Descended from the now extinct, huge Patagonian rabbits of South America, the Flemish were brought to Europe by Dutch Traders that were impressed with their size. The typical european rabbit of the time weighed about 5-7 lbs. and farmers were having difficulty supplying the demand for meat. They used the Patagonian to increase the size of their rabbits, and very soon they were even showing up on Exhibition Show Tables.